One of the biggest announcements to come out of Google I/O last week was Google’s new streaming music service called Google Play Music All Access. It’s like Spotify meets Pandora, in that you can check out any album at any time, play them as many times as you’d like, or use them to create special radio stations. It works on both mobile and desktop and is currently available as a free trial, but will jump up to a monthly subscription service once the trial ends. You can sign-up before the end of June and lock in for $7.99 per month, however, the price will go up to $9.99 on July 1. It’s pretty awesome, though, that’s for sure. But for many of you who are considering a move to All Access from something like Spotify, there is something you should consider should you have had the unfortunate pleasure of moving to a tiered data plan with your wireless carrier (shared data plans included). All Access lacks any sort of control over the quality of the music that is streaming through your device, meaning it can eat up data in minutes. Take the screenshot above as a great example. The left shot shows a test that a reader of ours conducted over WiFi using the default settings for both All Access and Spotify. He played the exact same album all the way through, which resulted in Google Play Music using up four times the amount of data as the same album played via Spotify. That’s pretty significant, especially with data caps as low as they are today. The screenshot on the right shows All Access after the same album with default settings, while Spotify has been turned up to its highest quality setting. 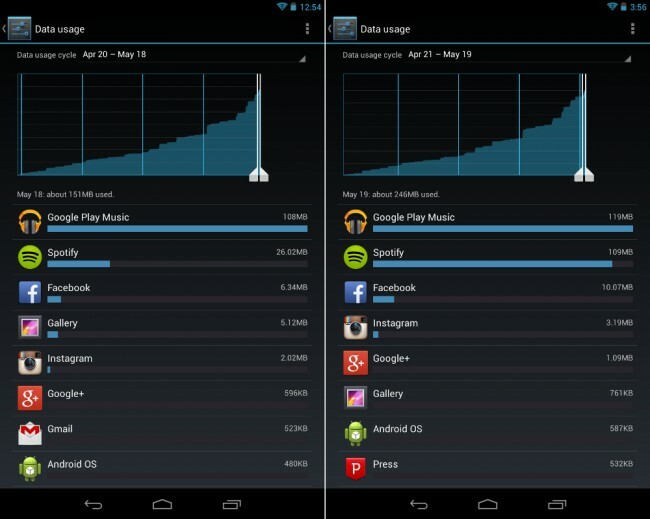 In this case, you can see that both consumed about the same amount of data. So here is the problem – Google Music only has one setting for quality adjustment. If you go into the app’s settings, you’ll see an option to force it to “Stream at highest quality only.” But that’s it, there is no way to turn it down a notch to help save you data. 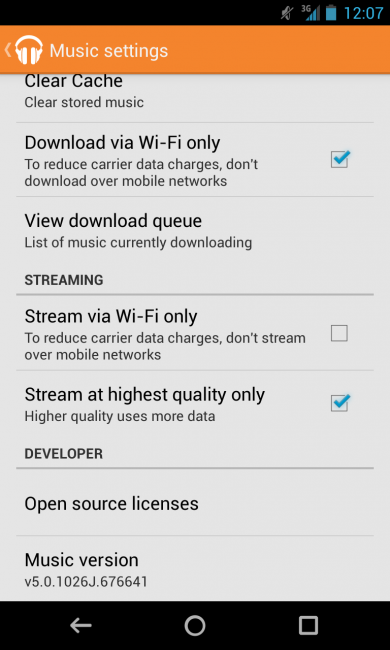 Google Music streams music based on your connection speed, so assuming you have a decent phone and live in an area covered by a solid 4G LTE network, (in theory) you will always stream the highest quality (320 kbps). You can’t tell it to not stream at high-quality, or to use a low quality stream instead. It all depends on how your network connection is. In Spotify, you have options to turn music quality to “Low bandwidth” (96 kbps), “High quality” (160 kbps), and “Extreme quality” (320 kbps). We would love to see Google change Google Music to include additional quality settings, especially when they want you to buy into their new streaming service and in a time when carriers are forcing you into tiered data, but the settings have been this way since it was first introduced. While we’re huge fans of All Access, be aware that it can gobble up data without you even realizing it.